This 3 nights of adventure enjoying nature at its fullest. Click HERE for the flyer. 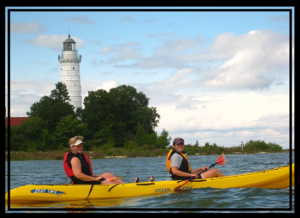 Kayaking with Gravity Trails along the shore of Lake Michigan taking in the beautiful view of Cana Island Lighthouse as the early mariners did. Gravity Trails Zip Line Tour takes you through the tree tops with a view you’ll never forget. Segway the Door Tour can take you into Peninsula State Park for Its quiet beauty or you can tour Baileys Harbor Lighthouse Tour, offering beautiful views of Lake Michigan, Toft Point Nature Pre-serve, and the Ridges Sanctuary. Premier views of the Cana Island Lighthouse, the “Birdcage Light-house”, and the Ridges Range lights are the highlights of this tour. This package gives you 3 nights lodging, full breakfast each morning, Gravity Trails Kayak tour and Zip Line tour through the trees, and a Segway adventure tour of you choice. Rates between $730.00—$865.00, per couple, pending on your choice of room. Package can be tailored to your interest and length of stay. Ask for a quote. ← The third night is on us.